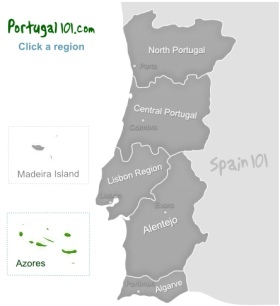 The Azores island group is one of the two only autonomous regions of Portugal (the other one being the Madeira Islands group). A little under 250,000 people live on the islands. The islands were discovered in the early 15th century, claimed for Portugal and the islands soon had their first inhabitants. The first people moved to the Azores in 1432 (so you will logically not find any buildings older than that on the islands). An interesting thing to note: sheep were released on the islands years before people arrived, so there would already be a good supply of meat when the first people arrived. There are some theories about earlier inhabitants – but none of them have been properly confirmed by historians and/or archaeologists so far. It is assumed that the name of the island group comes from the Portuguese word Açor, which means goshawk. The bird was quite common at time, but there is no proof that it ever lived anywhere on the island group. The Azoreans were always quite eager to emigrate to other countries, and the United States were always a very popular destination, so it is not too uncommon to find Azoreans or people with Azorean ancestors in the USA. Between the years of 1921 and 1977 alone, around quarter of a million Azoreans moved to the United States of America to start a new life there. The Azores consit of nine islands, but in the past, various regions have been called the “tenth” island because so many Azoreans moved there. In the modern age, people agree that the internet is the real tenth island because it allows them to stay connected no matter where in the world they are. 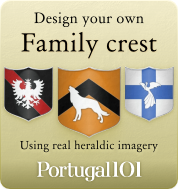 This is also a great help for people with Azorean ancestors who would like to delve deeper into that part of their heritage. What should you see if you visit the Azores? There are nine islands that make up the Azores, but there is also a small group of islets that also belongs to the Azores. The smallest and most Northerly island of the group is a rather unusual place to visit. You can see it all in less than a day, but it is a fascinating place and not many tourists go there. If you want a quiet holiday in a very interesting place, then this island would be the perfect choice – you just have to know how to keep yourself busy as there aren't any of the usual tourist attractions, apart from nature and some shops. 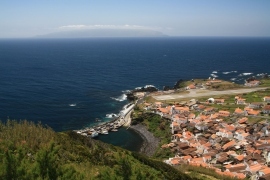 Faial is famous for its production of blue dye from the woad plant, but it is also a very popular destination for visitors, and during the popular months of the year, you will see many yachts arriving on the island. The island is in general quite blue, and often called the blue island. Flores, also often called the yellow island, received its name from its multitude of flowers (flores in Portuguese) and is a wonderful island to go to if you enjoy flowers. It is also a great place for hiking, as there are lovely deep valleys, lagoons, springs, and even some hot springs in which you can soak your tired muscles after a day of hiking. The white island Graciosa is the place to go to a rather peaceful island, try some local wines and simply enjoy the natural beauty of the island. Pico is the home to the highest mountain in Portugal (Ponta do Pico), and worth a visit even if you don't plan on climbing the mountain. It is a very scenic place, and the island has put a lot of effort into making tourism more sustainable. It is also a good place to try some nice wines! Santa Maria is the third smallest of the island and a paradise for people who like white beaches (in this regard it is very different from the other islands in the group as those have black, volcanic sand beaches). One thing that makes Santa Maria stand out are the rather unique chimneys. 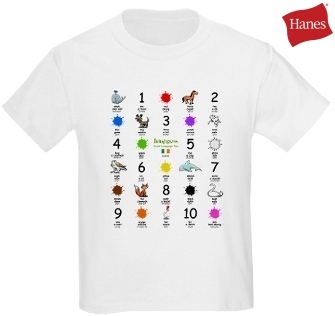 You'll just have to see them. This island was the first one who saw the arrival of people, so it is the one island that can tell you a lot about the history of the Azores. Anjos is a place on Santa Maria that is of interest if you would like to see the place Christopher Columbus saw on his way back from the Americas. 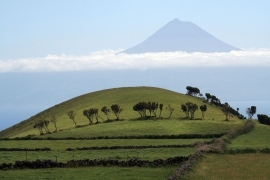 This island offers great views on the other central islands of the Azores, and is a rather “thin” island. There are some interesting buildings, and people who enjoy hiking can also have a great time on this island. The largest and most populated island of the Azores is also often called the Green Island, and very popular with visitors as it combines what the other islands have to offer on just one island (apart from the white sand beaches). If you want a good mix of culture, history, nature and black sand beaches, then you won't make a mistake if you book a holiday here. The lilac island is home to the oldest city of the Azores, and also a bigger island. 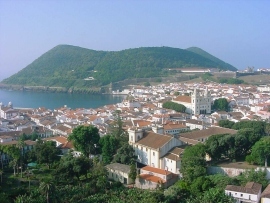 Angra do Heroísmo (the city) is also on the list of UNESCO World heritage sites. The Formigas are a group of islets and the only building you can find in that group is a lighthouse.